So how do you keep track of all the recipes that come flying at you in blogs, emails, websites, subscriptions, your mom’s index cards…. and even books? What happens if you travel somewhere? How do you access this? I’m getting the idea that what I do is somewhat unorthodox – I’ve found I’m usually on the path less travelled – but none the less there are occasional kindred spirits along the road. This is about how I keep track of it all. We’ll see how many of you think the idea actually has some legs. My inspiration goes back to about 2009 and a book The The Cure for Death by Lightning By Gail Andersen Dargatz. This is a wonderful, tragic, deep hitting novel about a poverty stricken community in rural BC in the late 1940’s. In it the mother of the main family keeps a scrapbook in which she puts and writes anything to do with her cooking. It forms not just a personal recipe collection and reflection, it is a diary – the life of her family revealed through a culinary perspective. I thought at the time that its a cool idea – and wondered how it could happen for me. It didn’t take me long to fix on Excel as the vehicle to go with. Recipes on the internet are always written in columnar fashion. I use excel for virtually any function that requires data entry, and feel very comfortable in this environment. It enables tons of text data without taking up a lot of space. It can be sorted so that a chronology can be entered. It’s easy to copy and paste a recipe – most of the time recipes are a simple copy and paste. It’s equally easy to respond to those “Ooooh! that was delicious – can you send me the recipe?”. Sure. No problem. It’s easy to find, easy to copy into an email and send it along. Each sheet is a different food category: baking, desserts, soups, salads, etc. Each column is one recipe. Each row has a few common elements: row 1: title; row 2: source or URL row 3: date entered; row 4 notes. Below that its however the recipe comes to you. And that folks is it! I should note that I have a couple of other sheets not part of this: a bread baking log, a sausage log, and a fermentation log. Being a google sheet, and in columns, its easy to read and even edit on an android phone. Easily store every recipe you have. Copying a recipe, you have the option to either paste the text only or keep it in a table. Thus you could easily pick off certain recipes and put them together as a small self published book for friends. Like with any spreadsheets you can widen or narrow the rows and columns. The text wrapping controls offer more possibilities than Excel. Generally if you are comfortable in a spreadsheet environment, you will be comfortable with this. Since its a google sheet, it’s best viewed in Chrome. If you don’t have it already, you may need to get Google Drive from their play store. If you can download it as an Excel document that will work too. If this means of storing recipes is an idea you would like to play with, download it as an Excel file, then do your playing. You don’t even need to do that. The concept is the thing. What I have done is to copy and paste one of the sheets with all its warts and wrinkles. I’ve made it editable by anyone with the link. It means that I am prepared for it to be inadvertently (or deliberately) messed up. I figure that chances are it will be ok, but if it’s not I’ll just copy and paste from my personal file. If you like it as an approach to store your recipes, great. Go for it. The value is more in the process than in the recipes themselves. As the years go by, it grows. How can it not? At this point, after 6 years, I’m about at 600 recipes. Who knows where it will go. I am curious in this day of infinite possibilities, how do you keep track of your recipes? My new crock pot. I’m so excited! Eric Satie, that eccentric Parisian who penned a couple of our most haunting tunes once said, “Show me something new and I’ll start all over.” I feel a little like that concerning fermented – or cultured – vegetables. Its now been several months that I’ve been experimenting with cultured vegetables. Its high time I chronicled it all on the blog. But so much has happened that I’ve decided to break it down into more ‘digestible’ chunks. 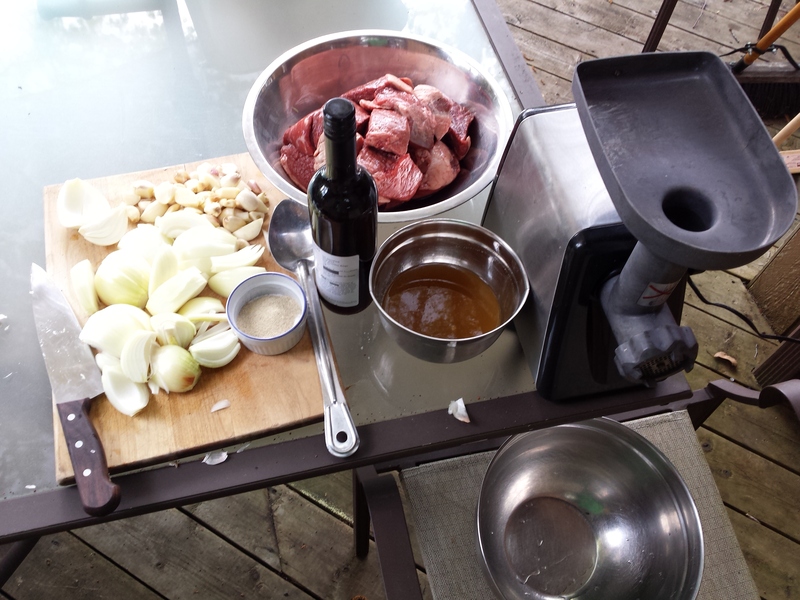 It all started this spring……and the annual wild onion harvest…. 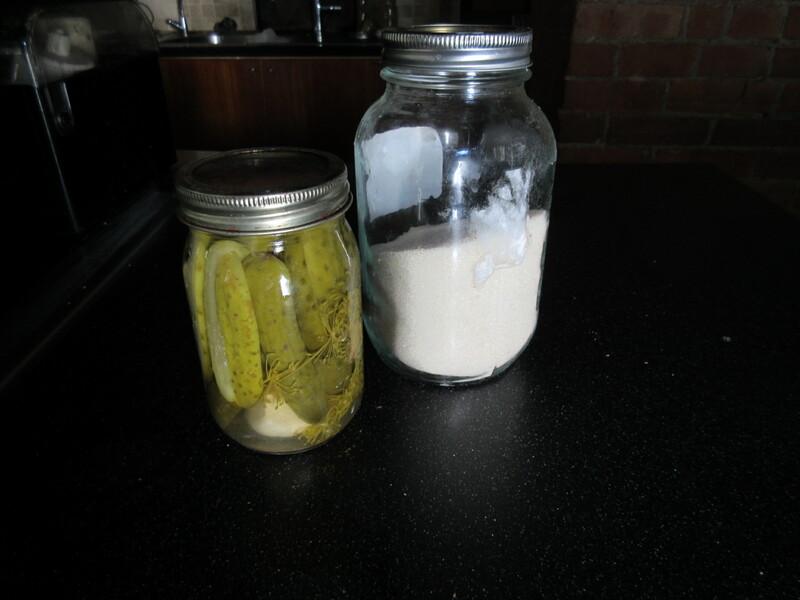 Vegetable fermentation had been on my back burner for several years. Michael Pollan’s chapter in Cooked still unread, a friend at my coop who said she’d show me not yet called. A combination of wondering what to do with an immense pile of wild onion leaves, and my butcher’s first release of cultured veggies got my ball finally rolling on this. I thought I’d start off with how fermentation works with vegetables and why these things are good for you. I’ll credit the sources as I go. All vegetables have small amounts of lactobacillus bacteria – among many others. Once exposed to water, they begin to feed on the sugars and starches on the vegetables, and do as all living things do: reproduce and excrete. In this case, they produce lactic acid and carbon dioxide. They are also very tolerant to salt – which is good, because the harmful bacteria which would lead to molds and spoilage, really can’t tolerate a high acid, high salt environment. 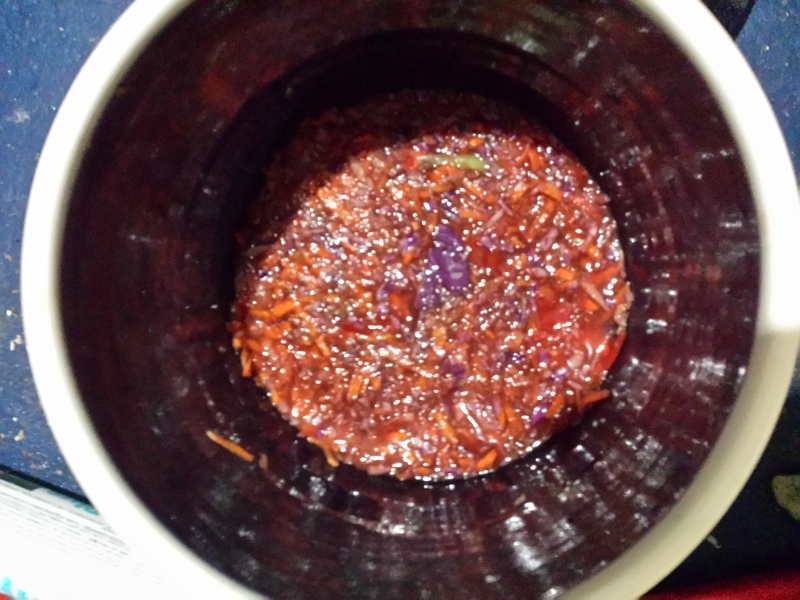 In making fermented vegetables, you are either going to add a brine (2-5% salt per weight of water) or add salt (2-4% by vegetable weight) then massage and pack down the vegetables, ensuring they are fully covered in the brine juice, then leave them at room temperature for a few days. That’s it, basically. But not quite – though you don’t need to do much else. In the fermentation process, 3 different species of lactobacillus eat, reproduce, release and finally die off. They succeed each other as the acid level rises and they can no longer live in that environment.The first lactobacillus that goes to work is Leuconostoc mesenteroides. Once it raises the acidity to .3% it dies off and in its place, Lactobacillus plantarum carries acidity to 2%. Finally Lactobacillus brevis kicks in until its final acidity level of between 2.5%-3.4%. It would carry on fermenting and developing stronger and stronger tastes – so this is when it goes into the fridge to slow it all down to a more dormant state. Our stomachs – indeed our whole digestive system – functions as a microbiome that is home to thousands of microbial species. Many of them are in the lactobacillus genus and are responsible for secreting chemicals such as serotonin and dopamine which affect our moods, appetite, sense of fullness and well being. Clearly what we introduce into our digestive biome is going to affect and alter it – for better or worse. In the case of our fermented vegetables, its for the better. The lactobacillus interact with and complement the digestive work of our own bacteria – improving digestion, regulating mood, and generally getting our whole system in balance. Claims have been made that fermented vegetables help with conditions such as diarrhea, yeast infections, urinary tract infections, colitis, food addictions, autism, and addictions. To a couple of market vendors who got me really rolling on this journey. These weren’t really long conversations – but enough to get my own internal fermentation going on this. Cathy at http://www.countrymeadowmeats.com/ who rolled out her first cultured vegetables the same weekend I did my first go at fermented wild onion leaves. If you are up in Owen Sound – definitely visit them. Dina who runs Mighty Fine Brine who turned me on to brined pickles, and to the wild fermentation facebook page! 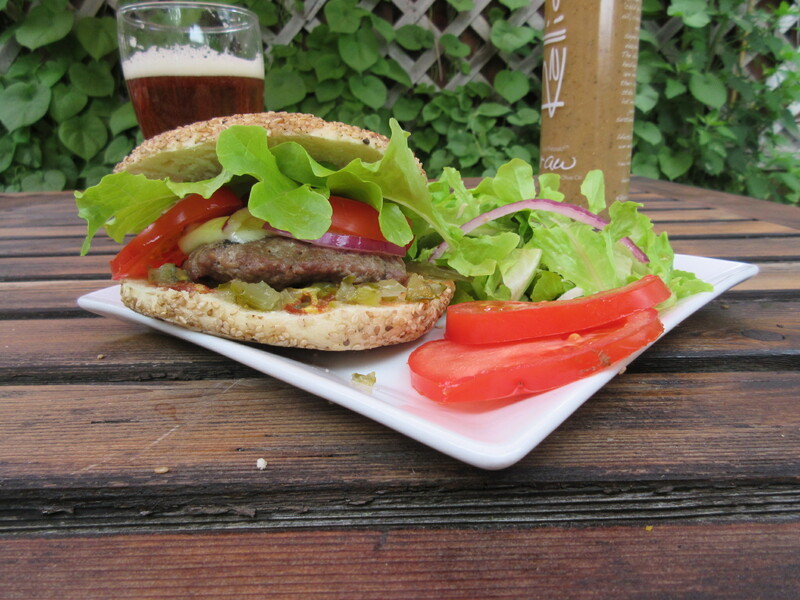 This blog is all about how to make your own homemade burgers. I don’t only mean the meat part. I mean everything that goes into them: the condiments and the buns as well. Well, maybe not the cheese, and you may be buying your own tomatoes and onions too. Nor is there a beer recipe for an accompanying brew. This is about everything else: the pattie, the bun, the condiments. I know that can sound a little silly given what most people do: head down to the store, grab some buns and some patties, cut up a few tomatoes and cheese. Barbeque. Dollop store bought ketchup, mustard, and relish on them. This blog is for those who want to kick up their culinary game and do it all from scratch. So if you crave the adulation of your foodie friends impressed with your culinary DIY wizardry, then read on. In addition to the meat, I’m including a lentil burger recipe for all the wonderful vegans and vegetarians out there. I’m also covering mayo and dijon mustard, as I know lots of you like those on your burgers too. It may seem quite daunting but really, its not. Everything except the buns are all made ahead of time. I’ve got other blogs where this is all referenced. However, I’m putting up the recipes here so you can stay on this page and make a batch of 6 burgers plus all the trimmings from what’s here and have a great time. You can dig into my other blogs for more details and refinements. So let’s go into each of these pieces that makes up the quintessential American burger and look at how each one is done. Before we start… know this…. 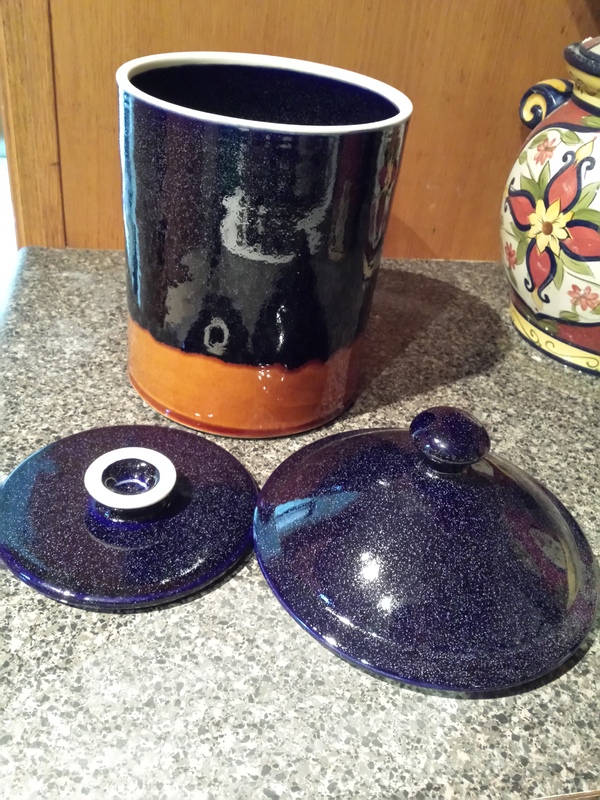 I use a weigh scale and everything here is expressed in grams…. Let’s start with the buns because the buns are the only thing you need to really think about the day of. After all, if you’re going to all this trouble, why ruin it with buns a day or two old? I’ll assume that you’re somewhat familiar with baking but if you’re not that’s okay too. I’ll separate this into a note for those of you comfortable with making breads and another for those of you not so familiar: A fail safe bun recipe. The quickie recipe may be a good option for those of you ‘already bakers’ but pressed for time. Familiar with bread already? Make up your basic bread dough – whether its yeast, sourdough or something hybrid. Prepare your dough as you usually do. 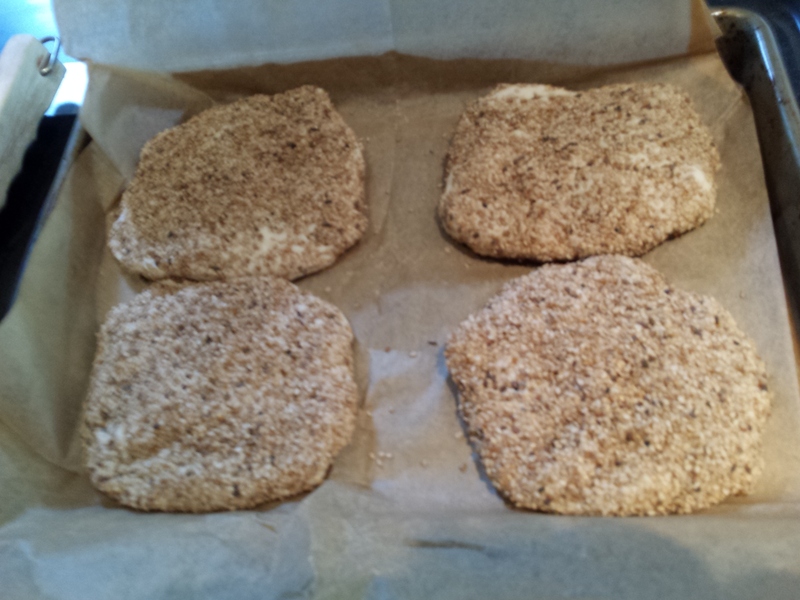 When it comes time to shape, cut the dough into 110g or so chunks and let them rest while you get other things ready. Prepare a cookie sheet big enough to handle your buns. Line it with parchment paper or a silpat liner. Pour out a mound of sesame seed on the counter. Gradually press out the burger bun into the sesame seed and gently press them out until they have reached the desired burger shape. Egg white wash is optional, as is a brushing of oil on the top. Cover with a damp cloth until they have risen – as you would for your usual bread. Bake for 12 minutes at 450 – you may need to adjust this depending on your local situation, but the buns should register beyond 190 degrees when done. While the yeast begins to develop, mix the dry ingredients: 390g flour (all purpose, whole wheat, a combination – your choice), 7g salt. 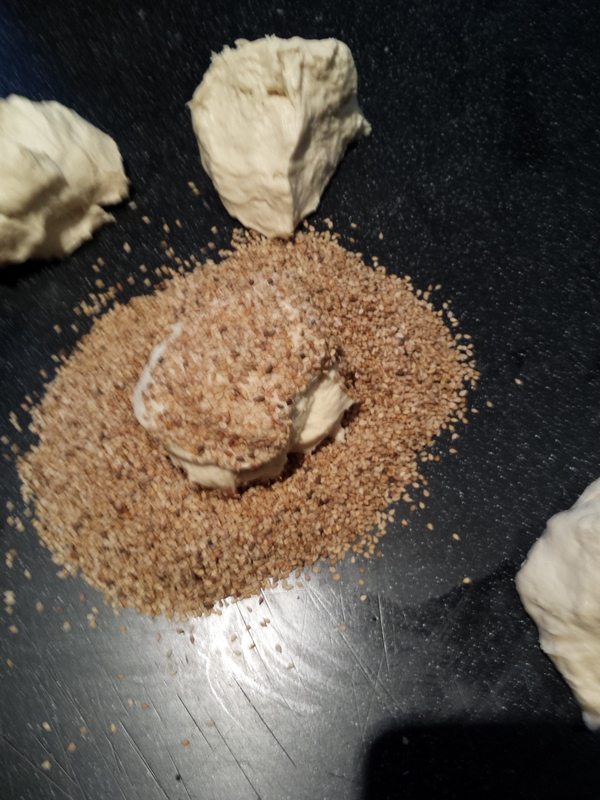 Combine the water/yeast with the flour/salt and knead for about 5 minutes. Cover with a damp towel and leave to rise until it is clearly rising. This will be approximately 45 minutes to an hour depending on the room temperature: the warmer the room, the faster the rise. Gently remove the dough and knead by stretching the dough and folding over itself. (View this video between the 4:50 and 5:30 mark to see the technique) Do this about 2-3 times, until the dough tightens up. Divide the dough into 6 even pieces and let it rest. Prepare a couple of baking sheets: either oil the pan or use parchment paper. Pour out a generous quantity of sesame seeds or what ever else you want to have appear on the outside of your burger. For each pattie, do a final stretch and fold, roll into a ball, press into the sesame seeds, gradually working the pattie until it assumes the size and shape of your ideal burger pattie. An egg white wash or brush with oil is optional and will result in a glistening top. Place on the cookie sheet and cover with a damp towel. Turn on the oven to 450. Once they are all on the sheet, leave about 20 minutes with a damp towel on top (for this quantity of yeast. If you decided to go with a lot less yeast and a longer rising time, plan on up to an hour). Bake at 450 for 12 or so minutes. Do check the buns after 10 minutes as the time will change according to both your oven and how many buns you cook at once. They should register at least 190 degrees when done. 60g red wine (about ¼ cup). Beer would work too – maybe a nice porter. These quantities assume it’s according to taste and preference. Typically, patties weigh in around 100g which is slightly less than a quarter pound. But doing it yourself means that you can do whatever you want – though if you make them too thick and big you may have logistical issues with your bun, and risk them being uncooked on the inside and charred on the outside. I probably wouldn’t go less than 90g nor more than 150g. That all said, a 50g pattie makes a great breakfast sandwich slider, with eggs and cheese. To freeze, shape the mix into patties, individually wrap in wax paper, put in freezer bag and then into the freezer. 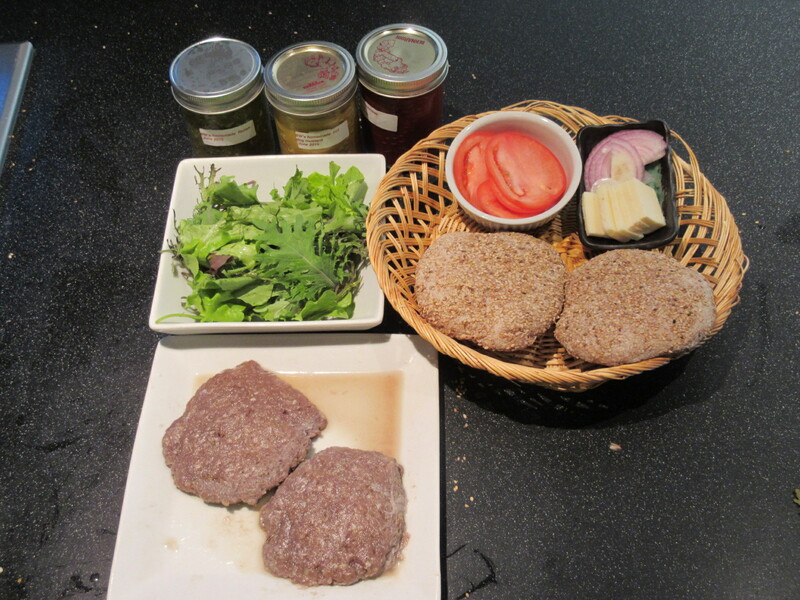 To defreeze, microwave to raw (1 minute for 1st pattie, 20-30 secs for each additional pattie, spread out on a plate). AAAND they’re ready for the bbq. To serve fresh, cover and refrigerate until needed. For all the vegans in the crowd, my lentil burger recipe. This is based on a Chef Michael Smith recipe I have messed with, but its definitely different enough for me to call it my own. add other ingredients and keep simmering until oats have disintegrated and the mix is getting thick and sticky. ALWAYS keep stirring to prevent burning. The idea is to achieve the thick stickiness needed to hold the pattie together when cooking. shape into patties and refrigerate or freeze, or leave as a mix and form into patties right before cooking. You know how frustrating it is to extract just one frozen pattie, or piece of fish, or bun or what have you from the package in the freezer? Here’s how to avoid that. Spread the wrapped patties on a baking sheet and put that in the freezer for an hour, then bag them in sealed plastic bags. They will freeze in such a way that they will not stick together when you retrieve them. Tomato ketchup is pretty easy. It’s essentially tomato paste + vinegars, salts, sugars and flavorings. I usually make a batch of green tomato chutney each year, at the height of the green tomato season and for my ketchup I use a cup of that plus a small 125 ml can of tomato paste. My blog on the chutney describes that preserve, and what I have done here is to distill that recipe so that you have measurements for 1 250 ml jar that you would combine with a single can of tomato paste. If you want a jar of chutney, roughly chop the tomatoes, onion and apple using the pulse function of a food processor until they are the size and consistency you like. Add in the other ingredients. Leaving it for a week or two will help meld the flavors. For the ketchup, puree all the fruit and vegetables, then add and mix in the sugar, vinegar, spices and a small 125ml can of tomato paste. Relish essentially is pureed pickles plus sugar. If you taste commercial relish you will see the truth of that very quickly. It’s also salty so there’s sweet, salt and vinegar and that’s why we love it so much. Pickles & sugar is all you need. To prepare the relish, weigh out the pickles and then add 10% of the pickle weight in sugar and 10% of the pickle weight in the pickle vinegar brine. Although there is already salt in the brine, I suggest adding a little more – to taste: 3% of the pickle weight. Using the pulse of your food processor, chop until it is the desired consistency. 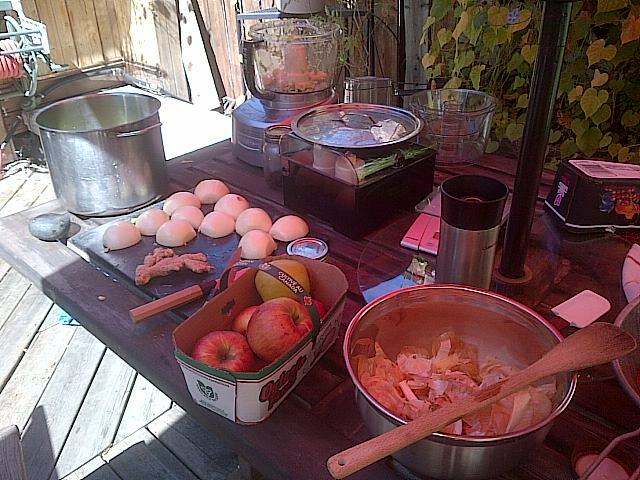 You can experiment with other additions: garlic, spices, apple come to mind. An example of this would be: 300g pickles, 30g sugar, 30g pickle brine, 9g salt. I’ve been having a lot of fun with mustard lately as you can see in some of my other blogs. Recently I came across a recipe for hot dog mustard by Joshua Bousel. He has you mix yellow mustard powder with water, and add salt, vinegar and some turmeric and garlic, then cook it briefly for about 5 minutes. The recipe here gives you almost a cup and it’s also weighed in grams which is the way I like to do business. Place water, mustard, vinegar, flour, salt, turmeric, garlic powder, and paprika in a small saucepan over medium heat and whisk until smooth. Bring mixture to a boil, then reduce heat to a simmer until thickened, about 5 minutes, stirring often. Allow mustard to cool, transfer to an airtight container and store in the refrigerator for up to a month. Mix these together to yield a 250ml jar. It will be quite hot. If you want it calmer, put the mix in a pot and heat it up, tasting until the heat is at a level you prefer. Leave it at least overnight for the mustard to absorb the liquid. Some people love mayo on their burgers. For you, here’s mayo. This is Michael Ruhlman’s take on it, as described in his inspirational Ratio book. This will yield 1 cup of mayo, so I usually double it as it is tricky and labour intense. You spend the same time and labour making a double batch. Beat in this exact order. 1 cup oil: You want a really mild almost tasteless oil, as it will impart whatever flavour it has to the mayo. DO NOT therefore use cheap, harsh olive oil. My preference is grapeseed oil. Start with the largest bowl in your possession and a good big wisk. Have all ingredients prepared beforehand as once you start whisking you are committed to the end. Also strategize and position the bowl so that it is held in place while one hand whisks while the other pours. Some ideas about this are: sitting and wedging the bowl between your tummy and the table edge, or using a rolled towel to sit the bowl in. 1 large egg yolk at room temperature with 1 tsp water at room temperature. The successful beating of the water and egg yolk is critical to everything else that happens. If this does not emulsify, the rest of it won’t either. If this is proving difficult, make sure your egg is relatively fresh, and also that everything is at room temperature. Add the oil in a slow stream to the whisk. Optional: 1 tsp – or 2 of Dijon mustard. Indeed you can add whatever you like at this point to make your own unique artisan mayo. If you mess it up, and it breaks, pour all the mayo into the oil cup, and start over. Add a teaspoon of water and another yolk and try again, whisking until emulsified. Slowly add in the broken mayo, whisking continuously. Well – That’s it. Sure it would be a massive undertaking to do all of this on one day. And you are also likely to be serving other stuff as well -snacks, dips, salads , desserts, etc. Just keep in mind that everything but the bread can – indeed should be – easily be prepared ahead of time, and the buns can be done while you are doing other mealtime prep. Enjoy your burgers and all the praise & awe from your gathered friends!